One of the benefits of working in a call centre that we’ve mentioned plenty of times is the friends you get to meet. But not just some colleagues or teammates you share some chats with, but friends that are in it for long haul. You know, your besties who are there by your side even when you leave this job or embark on another journey you can count on them to always be there when you need them. OK, so there is a difference. 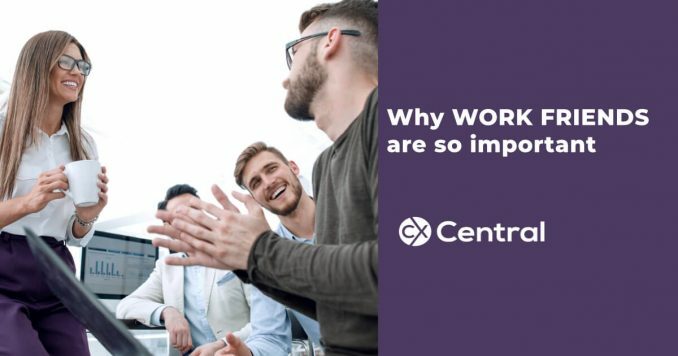 But importantly the study refers to people that have work friends being typically more engaged in the workplace. And being more engaged at work is better for you, your business and the customer. Working in a call centre, or any job truth be told, can have its moments. Being able to speak to someone about your frustrations, who understands the environment and the same pressures, is a great way to digest and get a different viewpoint that can help keep things in perspective. According to the founders of The Culture Works, the average employee spends about fifteen hours a month complaining about his or her manager. OK we don’t condone bagging out the boss, but you get the drift. Talking about your frustrations can be a great way to reduce stress so having a friend to talk to at work is good for your mental wellbeing. Sure you love going to work and talking to customers all day while being measured within an inch of your life. But let’s face it some days can be hard work. Having a work friend who you can share a laugh with during your shift can make even the worst day a whole lot more bearable. And then there are always the breaks and after work drinks where you can spend time with people you actually like. From talking about the TV shows from the night before, the latest sports results or dissecting a complex relationship issue there’s is no need to wait until after work to chat to your friends when they are right there. We all know by now that having work friends in the right places can be beneficial for your career. We aren’t condoning anything illegal here, but having a friend in a different department can help with you broadening your company knowledge outside of your immediate work area. Even from within the same area you’ll have someone to bounce some ideas around with who understands the environment and who knows, two heads might be better than one in coming up with new solutions. Because you’ve had a chance to chat with your best friend at work, you now have a heap of free time in the evening to spend on other activities. Take up a hobby, go for a walk, spend some time with friends outside of work (always very healthy to do!) or just lounge in front of the TV!